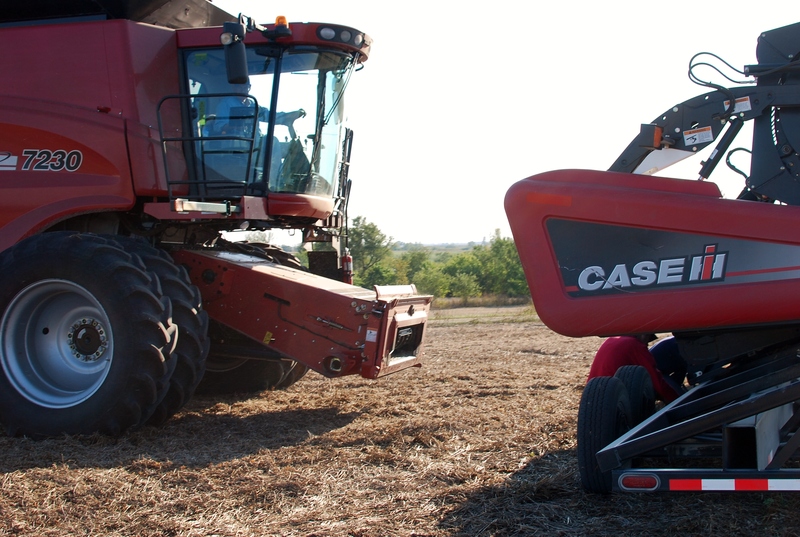 You are probably used to seeing pictures of combines looking like this: happily harvesting through fields with the sun setting in the background. I posted this pic to Instagram. For more day to day farm life follow me @daddystractor! 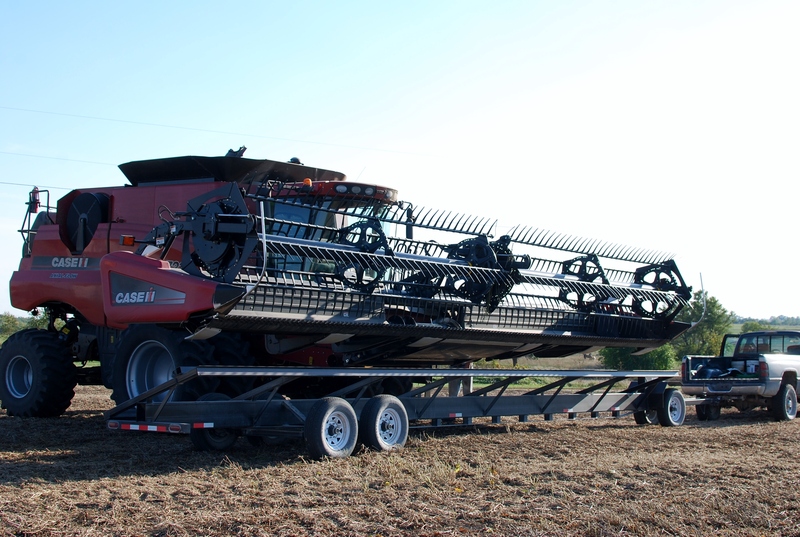 And while this is a good look for a combine, it’s a bit overdressed for traveling. 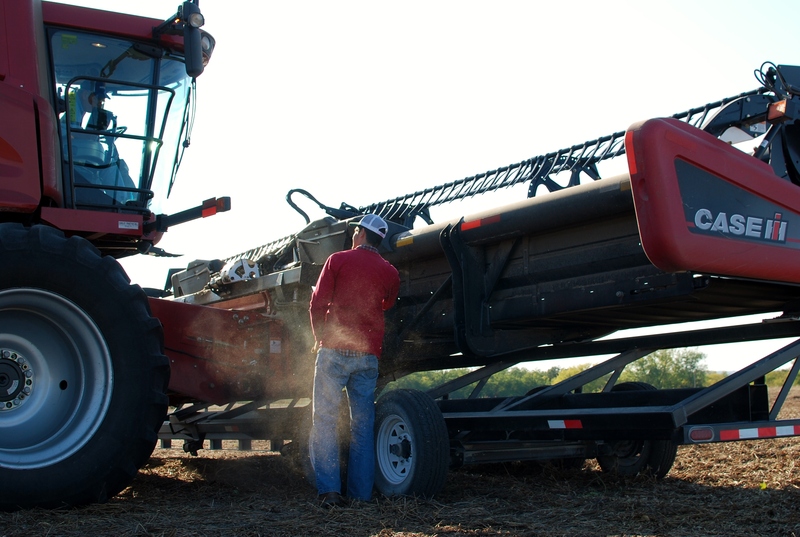 Traveling with a harvest operation can be a BIG DEAL. 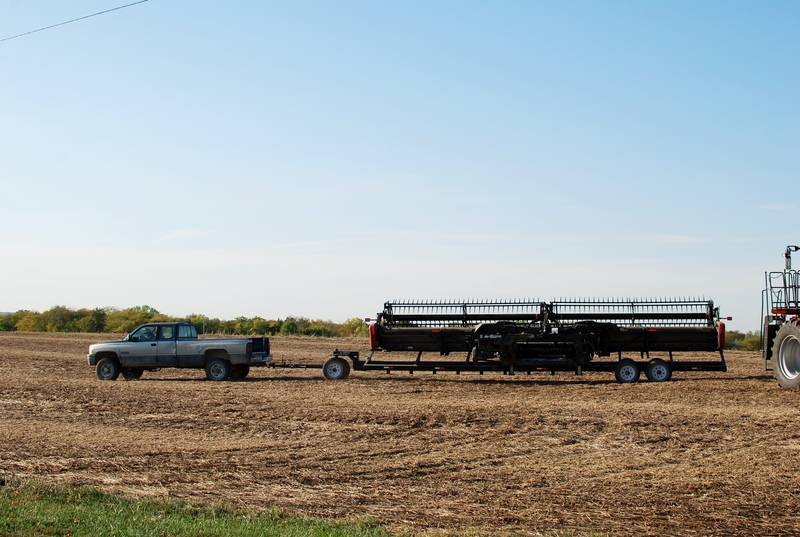 You’ve got to move the cart, the semis, the fuel trailer, the combine, and the head wagon down roads lined with overgrown tree branches, mailboxes and telephone poles. When this bad boy heads for the highway its tires can touch from one white line to the other. 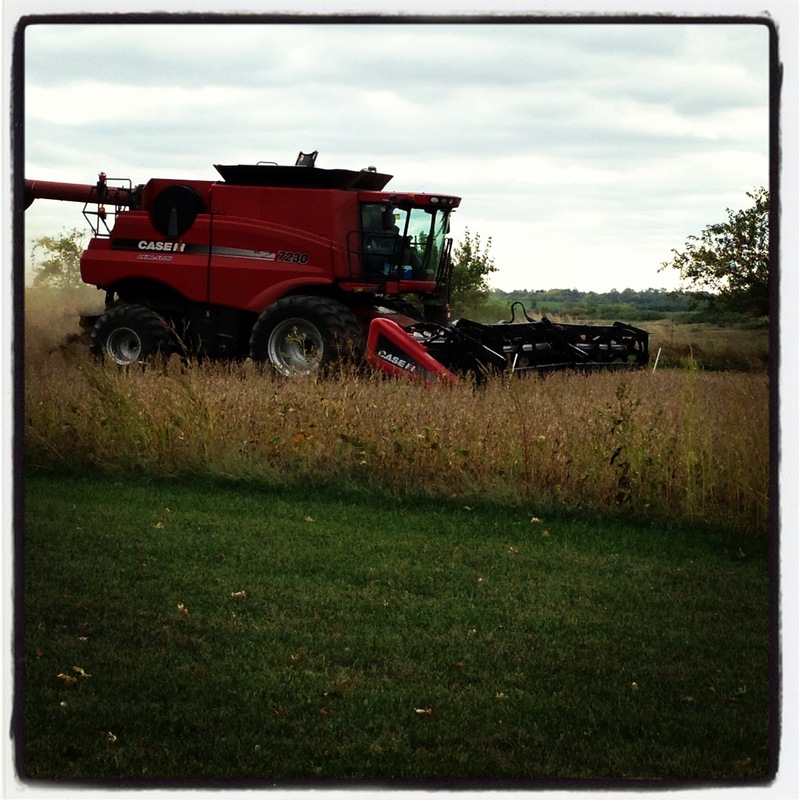 But that’s just the combine. 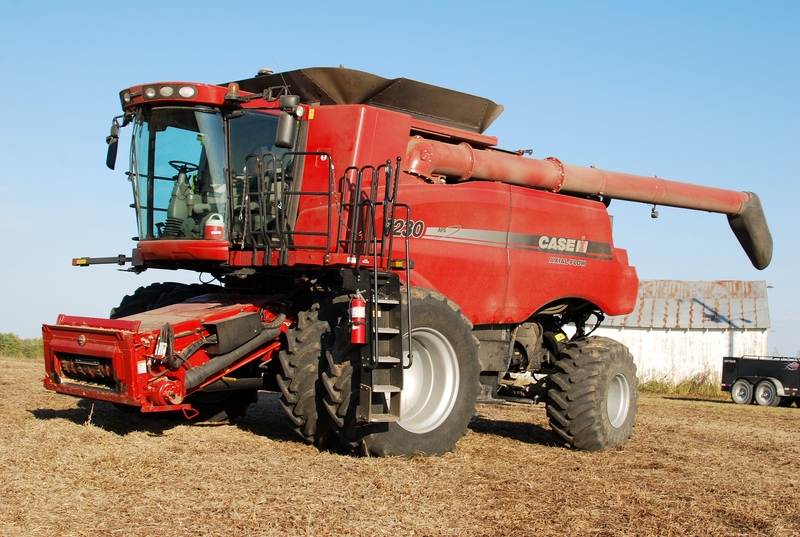 The head (on our combine) is much broader than the combine itself. In fact, it’s actually 35 feet wide! So before heading off into the sunset the head must be removed and loaded onto a wagon. This is best done with at least two, if not three people. Here you see Wayne (the newest addition to the farm) helping direct Grandpa to line the grain head up with the wagon. Cory is on the other side doing the same. When the head is properly lined up Grandpa can set it down and release it from the combine. Then the truck can pull the head wagon down the road. Looks a bit different, don’t you agree! It’ll still be a task to maneuver this massive piece of equipment down the road, but at least we won’t take out every mailbox between here and the next farm! LOL! Good advise, I’m sure! I’m impressed though. My family won’t let me drive equipment. They say I have to master the lawn mower first. So not motivated!! Thanks Seasonsgirl! Farming has changed a lot, even more so over just the last few year! I love reading about every day farm stuff like this that this city mom doesn’t have a clue about. We really wanted to visit you this weekend, but life turned out crazy. I’ll be calling to set something up as soon as we figure out our next free day. We missed your family! Let us know when you’ll be up this way– we’d love to get together! !